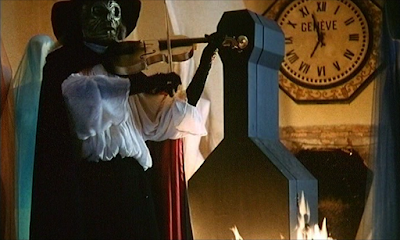 DVD Exotica: Kooky Cozzi Paganini Horror! If you like your stylish Italian horror flicks cheap, silly and weird, then you should already have this movie! But if you haven't been collecting horror DVDs over a decade ago, you probably missed out on Luigi Cozzi's Paganini Horror. But unless you're hung up on your movies being, you know, good by some kind of objective or reasonable standard like a normal person, in which case you'll probably absolutely hate this movie. But assuming you're not one of those people, then I'm here to tell ya, this German import's worth tracking down. If you're not familiar with this one, the plot is real simple. 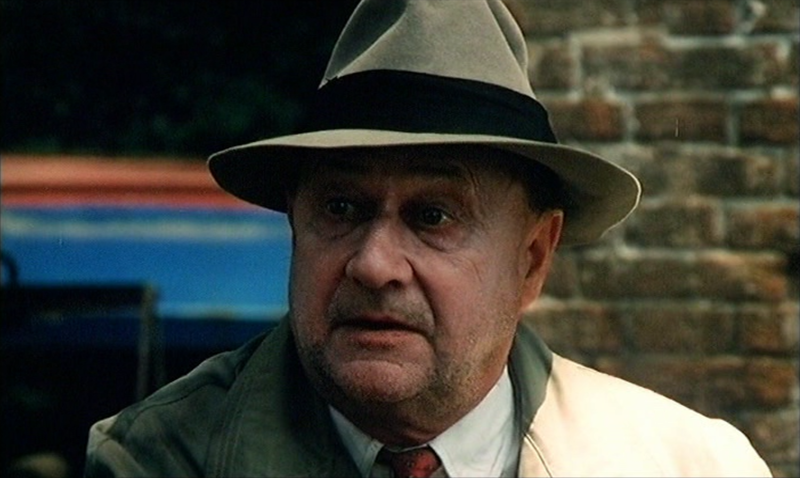 A guy buys a long lost score by the famous composer Niccolo Paganini from Donald Pleasance, who's also the devil or something along those lines. He gives it to his girlfriend, an aspiring rock star, to turn into a modern pop song with her band. Their manager, Daria Nicolodi, who also might be evil, wants them to shoot their music video in an old mansion that's stuck in a time loop, where some little girl once killed her mother just like Paganini killed his bride and used her intestines to string his violin as part of his pact with the devil. 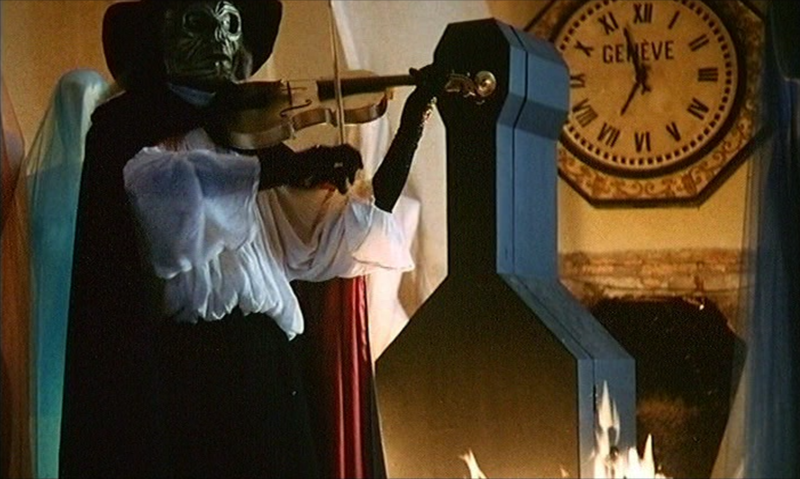 Plus, Paganini will be summoned in the flesh when the band plays his song, or maybe he's just a masked slasher, but either way his victims come back as ghosts and hmm, okay. 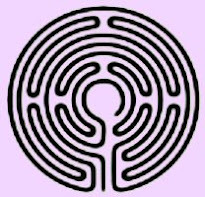 Maybe the plot's not so simple, or even quite comprehensible if you really stop to think about it. But why would you do that? It's a fun, attractive and charmingly daft little horror movie about a famous violinist come back from the dead to chase young people around a colorful music video set. It's attractively shot, Paganini has a violin with a knife that shoots out of it, there are a couple gnarly kills, everybody's running around in silly costumes, the music is upbeat and catchy - including a couple, full blown pop rock performances - and they've got some great location photography. On the other hand, the whole production is clearly low budget, and set pieces often look very cheap and the impressive casting of Pleasance is wasted with some bland third party dubbing (on the Italian and English audio tracks) and not terribly interesting dialogue (come on, he's the devil!). Plus, the story really is a mess. 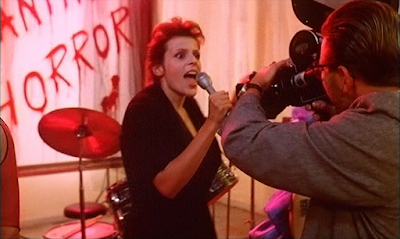 It's co-written by three people, including Nicolodi, which should put this on par with Suspiria, right? Yeah, no. So, the cult German label put this out twice on DVD in the early 2000s; all the cool sites like Xploited and Diabolik used to have this in spades. But now its long OOP. The first version was a 2-disc set, with the uncut widescreen version and a slightly trimmed 4:3 Italian television cut. 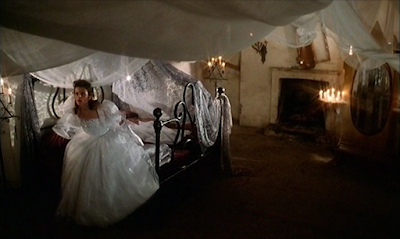 The second disc with the TV cut doesn't have English language options, though, and there are many differences between the two versions except some blood has been trimmed and the picture's open matte. So I just got the single disc edition, which is completely English friendly, and also happens to be a fully loaded special edition. It's pretty awesome, except for one little thing (which is just as true of the 2-disc set), as you'll soon see. ...It's non-anamorphic. It's not interlaced, taken from film elements (occasional flecks and dust pop up; but for the most part it's pretty clean) and in the director's presumably preferred 1.66:1 aspect ratio. But yeah, it looks awfully compressed and low on detail in that tiny window. The non-anamorphic presentation is a real bummer, because this is a film that relies a lot on its look. An HD presentation would be most welcome (hint, hint). Audio-wise, they provide the English, Italian and German dub, which is great because you get to hear the alternate voices. Unfortunately, the only subtitles on-hand are in German, so us English speakers will have to stick to the English track unless you're multilingual. All the audio tracks are the original mono in 2.0. And did I say this was a packed special edition? Yes! Let's start out with a very informative audio commentary by director Luigi Cozzi. He also provides an hour-long on-camera interview. Plus, there's a brief clip of him speaking at a film festival. So you really get his full story across all of that. There's also a short video clip of him recording the commentary, for a little peek behind the curtain. But then you have probably the most important extras of all: the deleted scenes. Some of the deleted scenes aren't much, but some are really out there, because contrary to his producers, Cozzi wanted this to be a sci-fi film; so some of these scenes are pretty freakin' weird and out of left field. This release also comes in a very cool looking "hardbox," which is essentially an oversized clamshell case, like those classic horror VHS boxes from the 80s. If you did get that 2-disc version, the only additional extras you'd receive are a couple trailers and a small photo gallery. 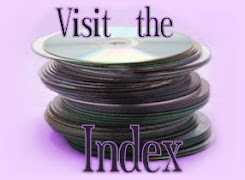 All the extras of substance are on the single-disc version. 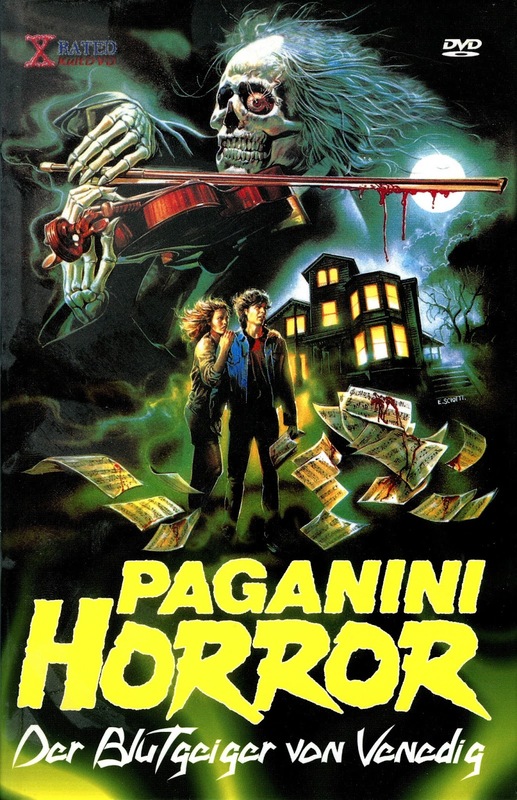 Paganini Horror seems like an ideal candidate for a label like 88 Films, but there has never been an American or UK release of this all throughout the DVD years, so I'm guessing there might be a rights snafu. So I'm not holding my breath for an HD upgrade. In the meantime, though, despite the huge bummer of this disc being non-anamorphic, it is a pretty great special edition of a neat, little film. 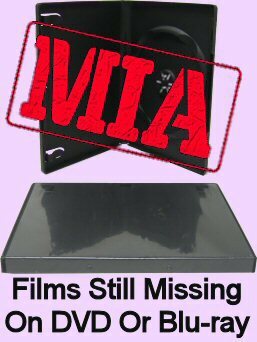 So this is definitely an off-beat piece of DVD exotica I'd recommend.